The New Mexico Roadrunners hosted their fourth JOAD and National Regional Indoor Championship Tournament in Rio Rancho, Albuquerque, NM. The format was similar to the previous years with JOAD tournament on Friday evening followed by the NAA Championship over the weekend. This year there was a late morning and late afternoon line on Saturday then an early morning and mid-day line on Sunday. This schedule allowed archers to fly in early Saturday and fly out late on Sunday. One first timer and eight “veteran” Arizona JOADs made the 6 to 8 hour drive to Rio Rancho. Weather was great, cool, clear and calm. Homemade New Mexico green chile was enjoyed by all at the tournament concession stand. The officiating staff consisted of Tournament Director/Judge, Jennifer Harvey, Chairman of Judges, Nancy Myrick and Director of Shooting, Linda Misenheimer. There were only a couple of dress code infractions that were quickly fixed with tourney shirts. Over sixty JOADs shot on Friday evening filling the 16 target bales. The spectator area was packed to capacity with family and friends. JOAD Trophies: You can’t talk about Rio Rancho without mentioning the exceptional handcrafted trophy wall hangings. Here is a recap. Just like last year over 100 JOAD, Senior, and Master archers, including a dozen Dine' College team members plus club supporters, competed. The hall was calm in comparison to the JOAD tourney the night before. The tournament ran smoothly and on time, providing a great environment for the archers performance. 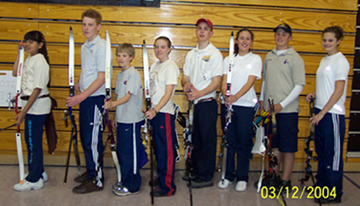 1st time at the Regionals was Anne Spire, cadet recurve, who joined the Arizona JOAD for the weekend NAA tourney. Circumstances do not allow Jenniffer Harvey and the NM Roadrunners to host the 2005 indoor championship. Arizona JOADs and archers from around the southwest will miss the hospitality. Remember to thank the Harvey’s and company for their hard work when you see them. Several of the Arizona JOADs did well at the Rio Rancho and at the Regional level. These JOAD also did well at the National Championship competition. Congratulation to all the JOADs that competed and the families that supported them.